Things are going well for the Tampa Bay Lightning right now. Despite a number of high profile players suffering injuries, including Andrei Vasilevskiy, Victor Hedman, Ondrej Palat and Anton Stralman, the team is still finding ways to win with whoever is on the ice. This is due to the Lightning featuring some incredible franchise depth that allows them to fill in the gaps when needed. This depth does have one drawback, though. At some point, those injured players will get healthy and return to the ice. The problem is, the players who were asked to fill in for their injured counterparts are playing as well, if not better than their predecessors. 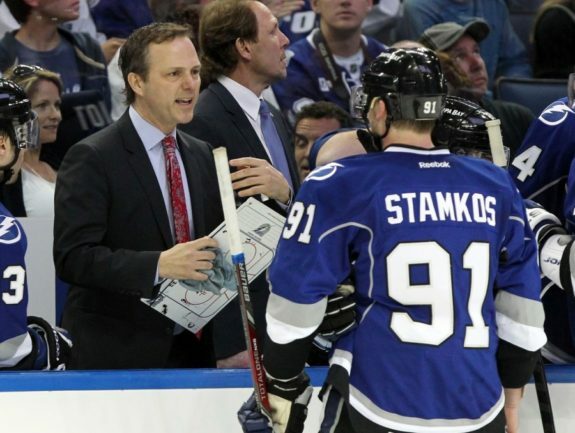 This has put Lightning head coach Jon Cooper in an interesting predicament where he has too many players deserving of NHL ice-time. As the last of the Lightning’s early season injuries heal, Cooper is going to have to make some difficult decisions about who stays on the starting roster, and who gets to ride the bench or be sent down to the AHL. With this in mind, which deserving players could become a casualty to the Lightning’s depth? Should Lightning Send Cernak Back to the AHL? 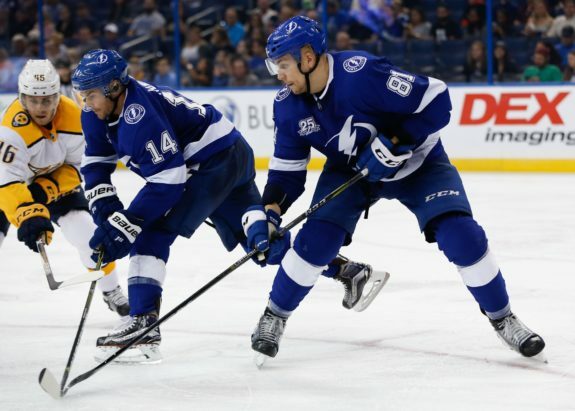 When Stralman returns from his long stint on injured reserve, the Lightning will need to make some immediate room on their roster in order to get their veteran defenseman back on the ice. The easiest answer would be to send his replacement, Erik Cernak, back to the Syracuse Crunch since he doesn’t have to clear waivers. Also, as a young defenseman, he would benefit from playing 20-plus minutes in the AHL rather than getting a reduced role with the big club. The issue is that Cernak has made a strong case that he is more than ready to take on a second-line role in the NHL. In 16 games with the Lightning, he averaged 17:45 of ice time, posted five assists, laid down 53 hits and held his own in his first NHL fight. Simply put, the 21-year-old rookie has looked like one of Tampa Bay’s best defenders so far this season. So, while it would be easiest for the Lightning to send Cernak back to the AHL, it would be the wrong choice. He has made an immediate impact on the team and has both the physical build and hockey IQ to continue improving in the NHL. Sending him back now would not only risk hurting his development but would cause a needless self-inflicted loss in the line-up. If the Lightning keep Cernak in the NHL, though, they will have to do something with their roster full of defensemen. In a perfect world, Stralman will be able to slot into a top-pairing role with Hedman, pushing veteran Dan Girardi into a limited role on the third line, while forcing Slater Koekkoek off the roster either through a trade or being waived. While it is never ideal to lose a player with the potential talent of Koekkoek, it may be time for the Lightning to move on from their 2012 first-round draft-pick with a younger and better option available. In many ways, Tampa Bay is dealing with this same over-crowding issue within their forward corps as well as their defense. With the return of Palat and the breakout play of rookies Mathieu Joseph and Anthony Cirelli, the Lightning have 14 forwards fighting for 12 roster spots on any given night. With so many forwards deserving NHL ice-time, the Lightning have been forced to leave a player like Adam Erne on the bench instead of giving him the ice-time he needs to continue developing his game. While Erne would benefit from playing with the Crunch instead of sitting on the bench, he would likely be claimed off waivers in the process, forcing him to sit in the press-box and wait for his turn to get on the ice. This same issue is also occurring for Danick Martel, whom the Lightning acquired off of waivers from the Philadelphia Flyers before the start of the season. As a small, skilled forward, Martel would be a perfect fit in Tampa Bay, but he has only played in one game this season. As the team continues to get healthy, it seems less and less likely that he will get any meaningful playing time this season. Should the Lightning decide to keep Cernak on the roster without sacrificing Koekkoek to waivers, they will have to risk losing either one of Erne or Martel in the process. If this is the case, there’s a clear right answer for Tampa Bay. Even if he is a skilled player, there is no reason for the Lightning to keep Martel over Erne. With an eye on a deep postseason run in 2019, a power forward like Erne will be of more importance in the playoffs, especially since they already have Cory Conacher stashed in the AHL. 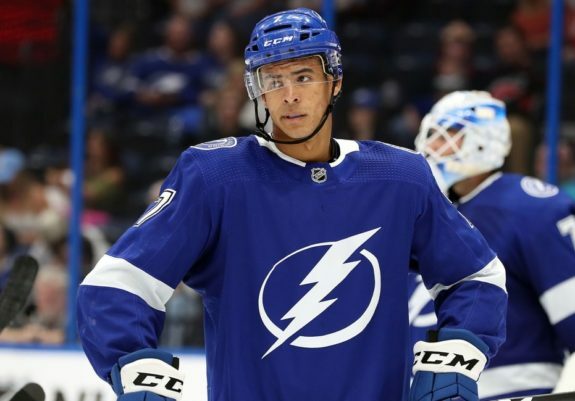 Despite the headaches it may create for Cooper and general manager Julien BriseBois, the Lightning are more than happy to have too much depth this season. In a league where injuries can happen to anyone at any time, having a back-up ready and willing to step into their role at a moments’ notice is imperative to making a long playoff run. Even if it means losing a bench player like Martel in the process, the Lightning should do everything they can to keep their current starting roster intact. This team is playing some of their best hockey in recent memory, so breaking that up to keep a borderline NHL player would be a mistake.